I’m grateful you’re interested in finding out more. I love to use and write about my experience with various marketing technology platforms. Everything you read on this site is to ensure the marketing automation space is the best it can be. I have over 12 years of professional experience in automation (corporate and entrepreneurial) and am as passionate about it as any athlete that wants their team to win a championship. My core belief is that you should always pick the tool the best fits your strategy and marketing objectives. That is the only way you can block out the noise of everybody else trying to convince you that another tool would be a better fit for you. As long as you’re using it and seeing great results…ignore it all. Lastly, my writing comes from my personal experiences using the tools I mention. I will never talk about a tool I don’t use, and if I do I will state I haven’t used it. The reason for this is stating features and using features are to entirely different aspects of marketing software. On paper, a lot of these platforms look amazing. But it’s not until you get intimate with them and use them in an attempt to render a sizable result for your business that you start seeing if the usability matches the promoted features. I’ve listed all my tool recommendations for 2018 here. And if you’d like to find out more about my personal journey in the marketing automation space feel free to continue to read below. I’ve been using technology professional for a little over a decade and absolutely love it. It didn’t start out that way, however. I graduated in 2005 from Kansas State University as an Electrical Engineer. A few months later I landed a job with Lockheed Martin as a Firmware Designer. During my first year on the job I decided to go back to school and get my MBA. I spent the rest of my 7 years there programming microprocessors for our nations defense technology (really high tech stuff). I never really grew to love my job at Lockheed Martin. It felt too technical. I mean I love technology but I also enjoy helping people figure it out and use it for their benefit. I simply couldn’t do that at Lockheed Martin. They wanted to put me in a cubicle or lock me in a lab to just write code all day. Needless to say it got old quick. I spent the latter years of my career there in desperate need of change. In 2010 my wife was laid off from Lockheed Martin (we worked together for 3 years and she is dual degreed in engineering and business as well). This served as a wake up call to me. I realized working until 65 to retire was not going to happen. The economy changed and I needed to make a shift. But before I get into my relationship with the world wide web it’s important to note that a good friend of mine gave me a book that changed my life forever. This book was entitled “The 4-Hour Workweek” by Tim Ferriss. It seemed to speak directly to me. I read about a life of not working long hours but still being able to live the life I desired. It all seemed like a fairy tale to be able to use technology to “automate your way out of the rat race”. As I ferociously searched the internet for ways to create this new “work week” I stumbled across marketers like Pat Flynn, Brendan Burchard, and Jeff Walker. They were all using technology to market their information online and appeared to be doing pretty well for themselves. I read it all. Bought products, attended webinars, and started talking to as many people as possible about this new world the internet exposed me to. Time went on and it all started to make sense. My confidence started to grow and I could actually envision myself having an online business and making a living off of it. Finally I was getting to a place where I didn’t need my stinking job at Lockheed Martin anymore. However, they were coming to the same conclusion. In the summer of 2012 they terminated my employment. Talk about shock, pain, fear, worry, and panic. I experienced them all at a very high level simultaneously. The confidence I had in starting an online business was quickly challenged by fear and doubt. I was married with 3 children (my youngest son was 4 months at the time), could I really start a business? What if it didn’t work? What would they eat? Where would we live??! I used the fear to fuel me into entrepreneurship. I took the only thing I knew, which was writing code, and started freelancing as a web developer. It wasn’t long before I got tired of that and even more tired of not making any money doing it. However, while I was freelancing I was exposed to marketing automation and knew it was exactly what I wanted to do. 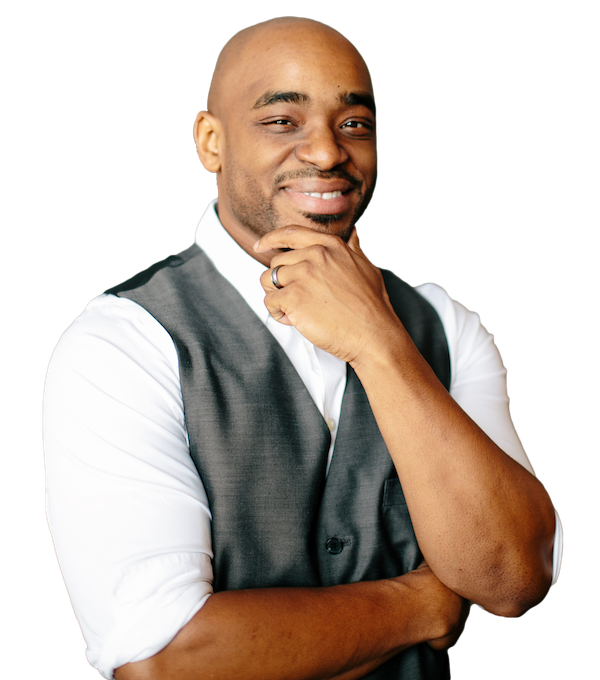 It was actually an interview on Mixergy with Jermaine Griggs that solidified marketing automation as the next shift for me and my business. That’s when I started this blog. Its initial purpose was to be an online extension of my business where I could offer digital marketing consulting services. It worked really well for me. It allowed me to tighten up on my skills with tools like Office Autopilot (now Ontraport) and Infusionsoft which eventually helped me land a position at LeadPages as an Automation Specialist then shortly after the Head of Marketing Automation. My current role is one I'm the most proud of. That is the Director of Education at ActiveCampaign. As a long time power user of the platform I truly enjoy the opportunity to internally help guide some of the product development and externally educate business owners how to effectively deploy marketing technology in their business for massive scale. It has been a long road but I couldn’t be more happy with how things have turned out so far. You will find various posts on this blog about marketing automation. I am currently using it to review 3rd party marketing automation software, breakdown and review entrepreneur’s funnels, and providing as much value and insight as I can to help marketing automation not appear so complicated. I would love to have you on one of my free trainings to show you a more in-depth walkthrough on how to autopilot any business.